I am trying to finish my office project before Christmas. 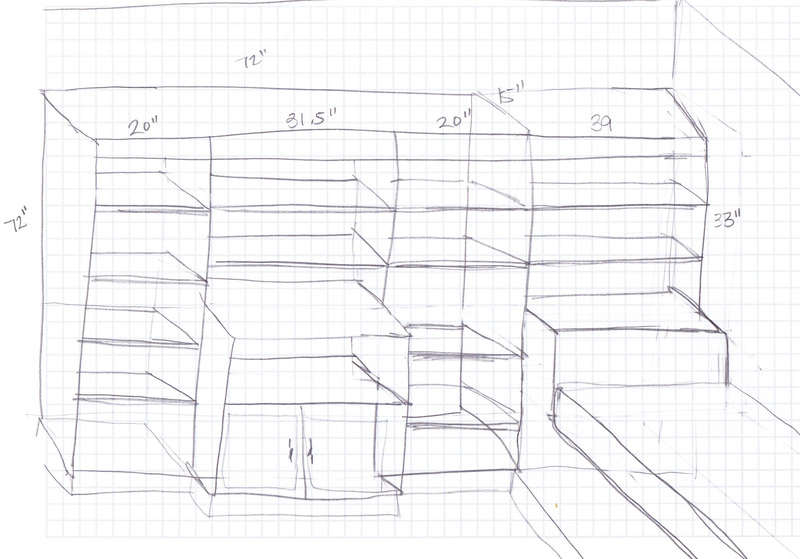 It will be an awesome gift to myself to be able to organize my workspace and store all my junk. 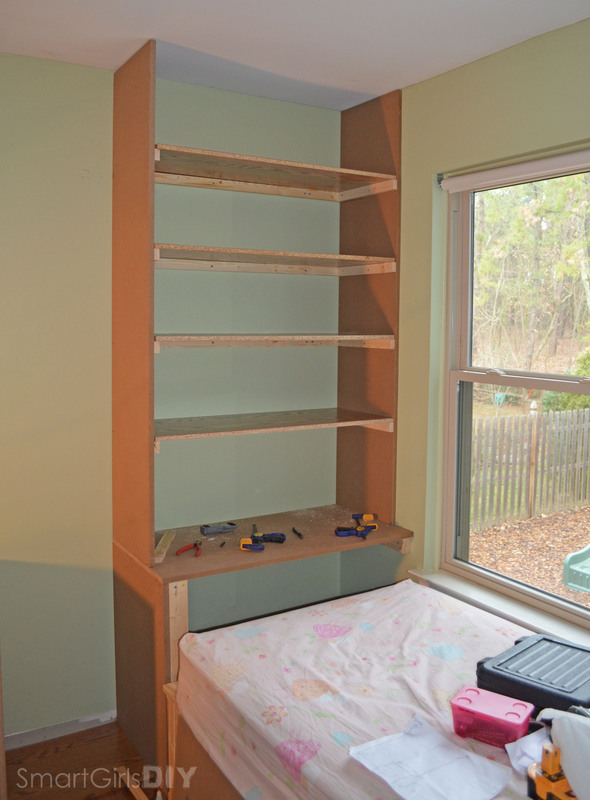 I still haven’t finished the window seat day bed, but it’s mostly just trim pieces left. 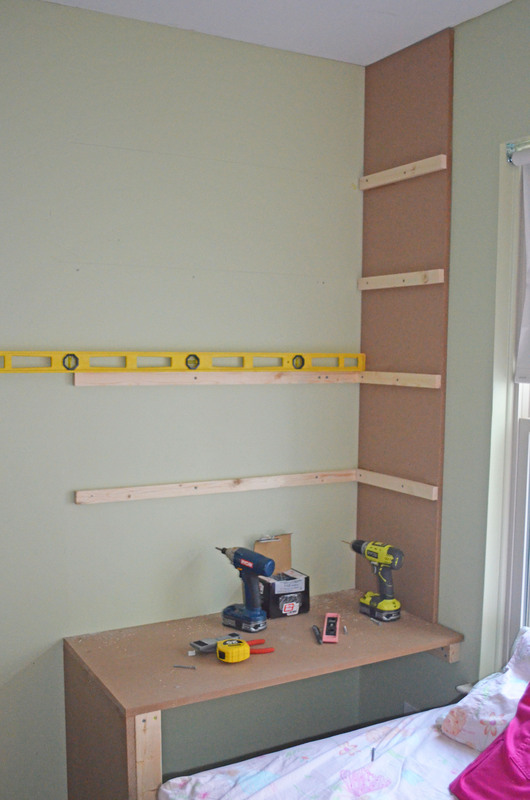 I’ll trim that out when I trim out the wall unit. They’re all really one big built-in piece anyway. 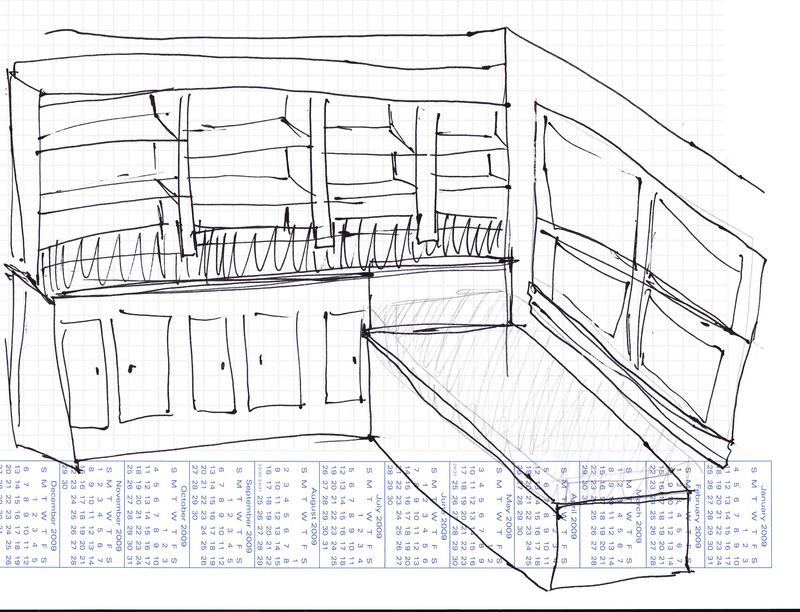 This was one of my original sketches for the day bed/bookshelf combo. But then I started looking on Craigslist to see if there was anything I could modify and save myself some time and money. 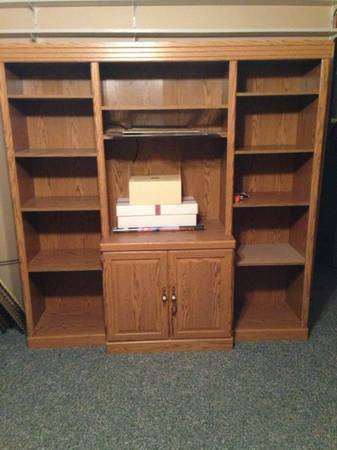 I found this wall unit for $20. 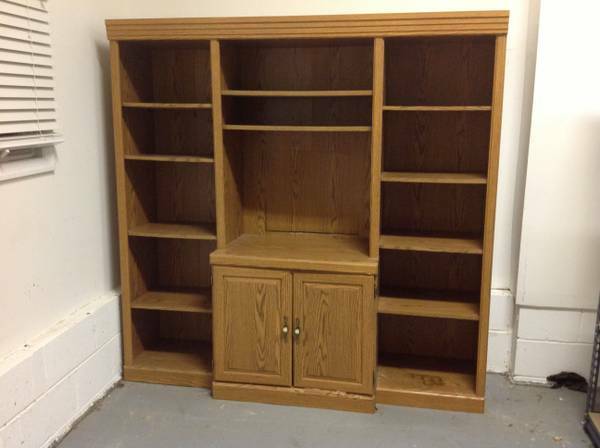 Interestingly, the same night, there were two identical units on Craigslist being offered for $60 and $200. Lucky for me, the one for $20 was in my town! So I modified my design to include the wall unit and hubby went to pick up the wall unit for me. But I was not impressed with the condition the shelf was in when he got it home. It had been in a garage and had water damage. It sat in the middle of my office for about 2 weeks and I thought of ways to work around its shortcomings (the bottom was deteriorating, I wished it were taller, and the trim along the top would have to be extended all the way to the wall). 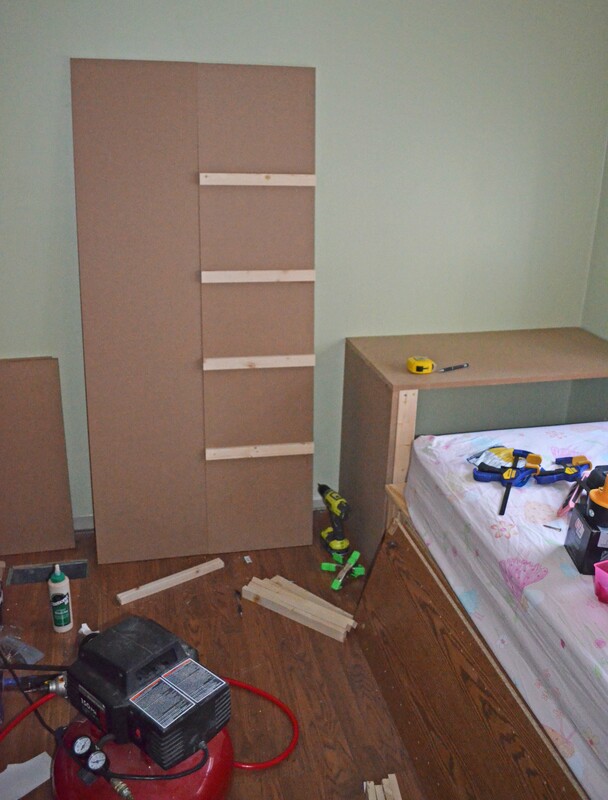 The plan was to build one additional unit in the corner that would attach to the day bed, and that is what I worked on today. 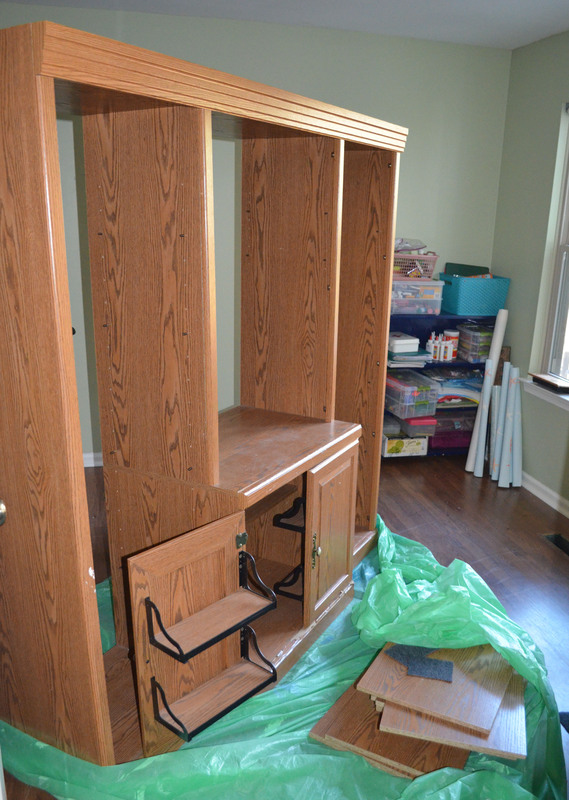 In the end, I scrapped the Craigslist unit, but I did use it as a guide to build my own unit. 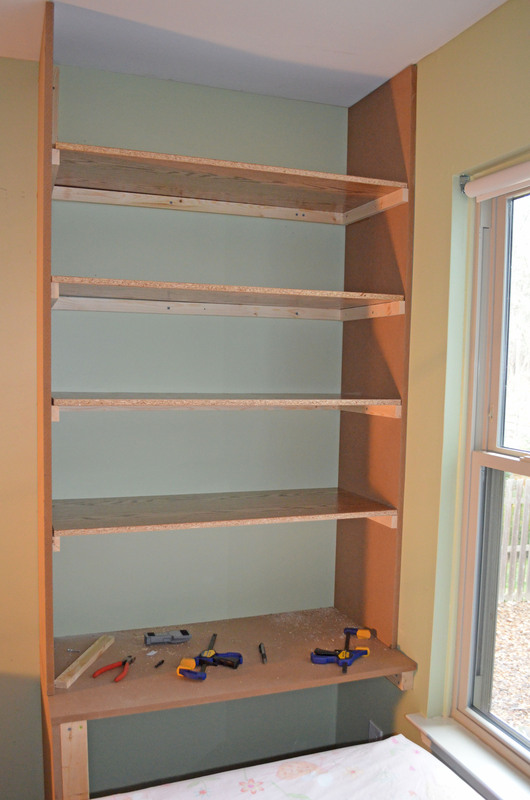 I also salvaged all the shelves. So I’m trying to tell myself I got my $20 worth. 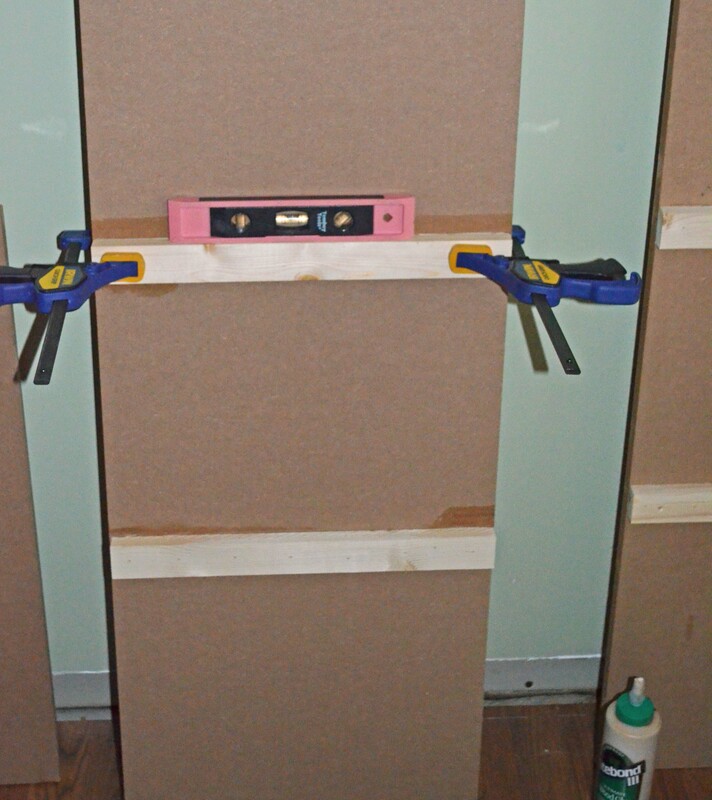 I started by attaching supports to the wall. Then I built out the base. Sorry the pictures are so dark. It was nighttime. I work while everyone else sleeps. 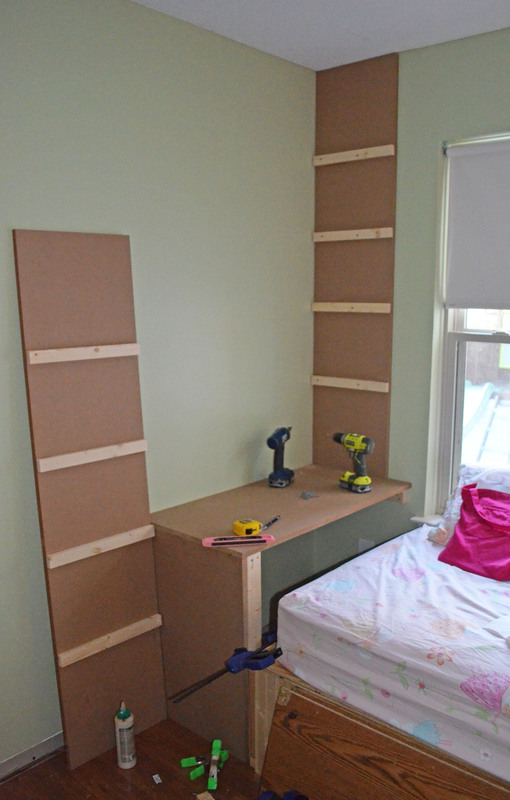 Then I added the MDF. Don’t worry, there will be a front. 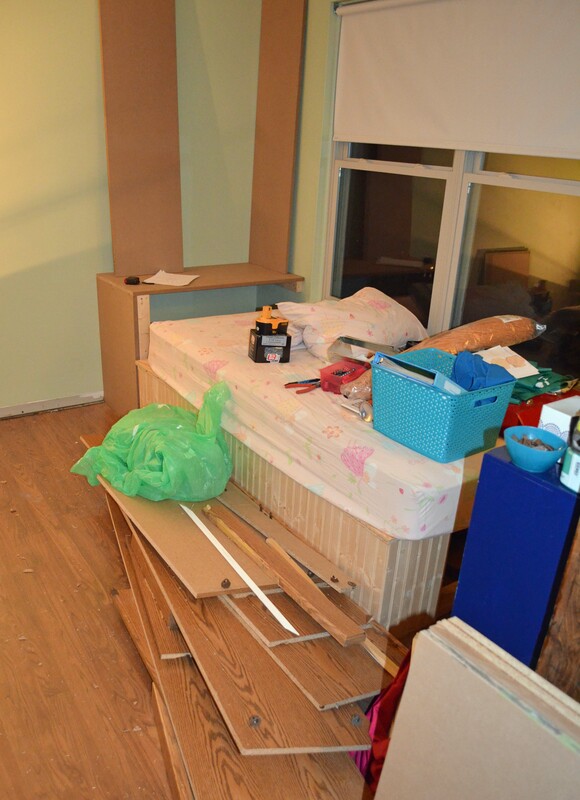 You can see in this shot that I demolished the Craigslist bookshelf. Those are its remains on the floor. 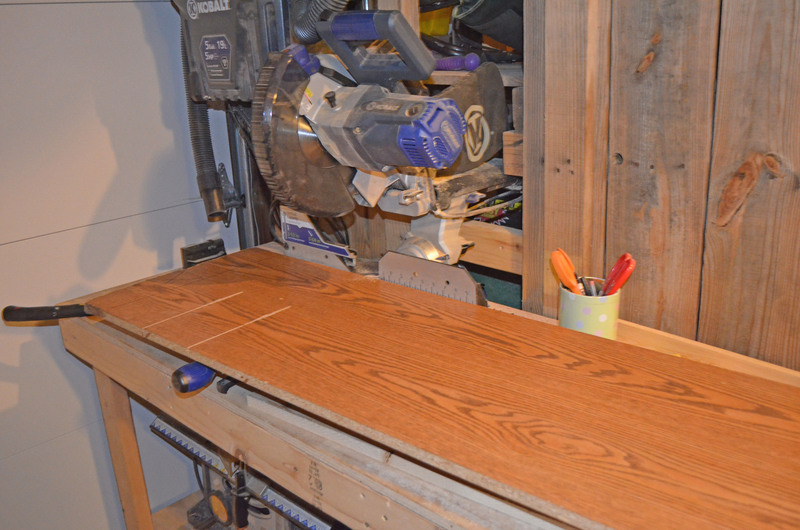 Then I moved on to the upper portion, which is not as deep as the bottom, but still pretty darn deep at 15.5″. 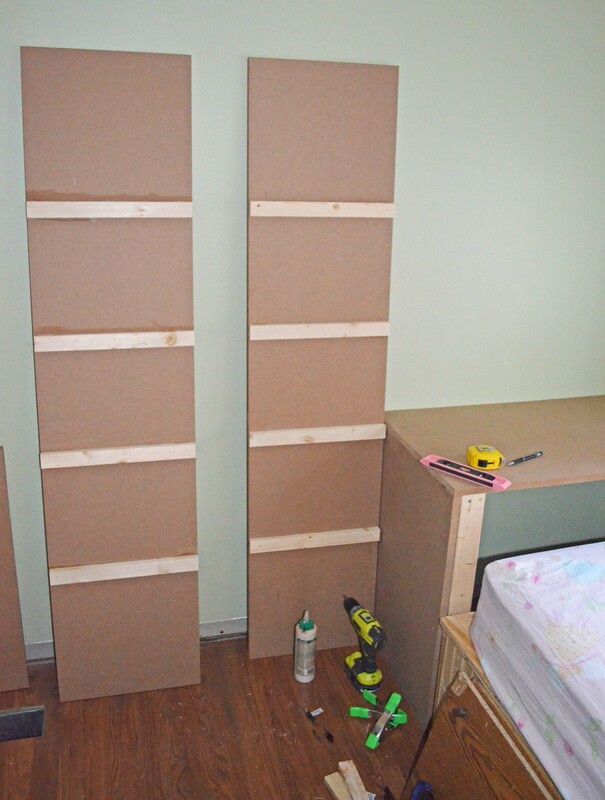 I added the supports to one side, then transferred the measurements to the other side so they’d match up perfectly. 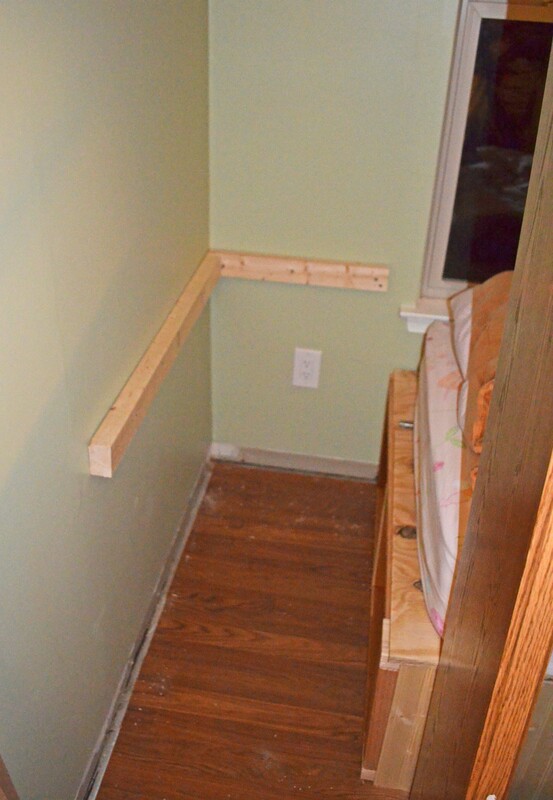 I screwed the right side piece into the wall studs. 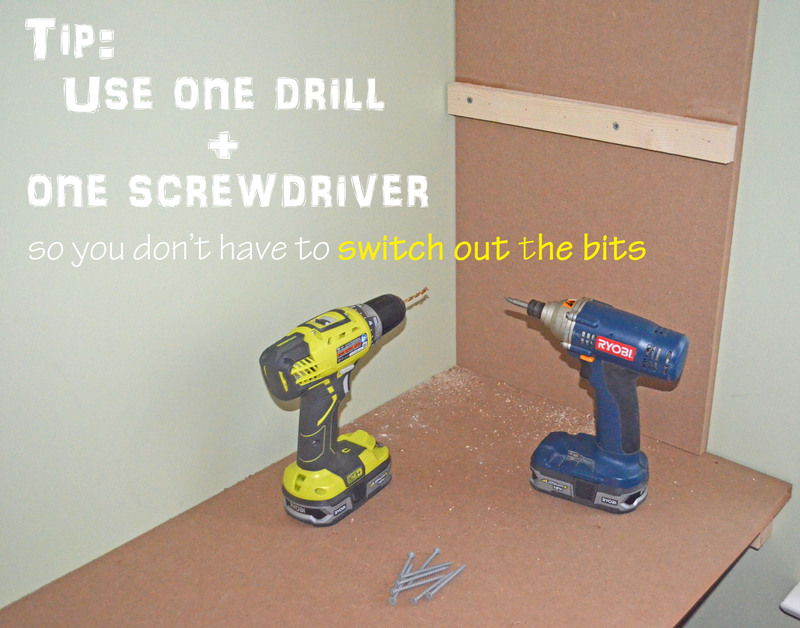 This is one of those common sense tips that is a no brainer once you think of it… Use two drills (or drivers) whenever you’re pre-drilling holes. Keep the drill bit on one and the screwdriver bit on the other. That way you won’t have to keep switching back and forth. Such a time saver! 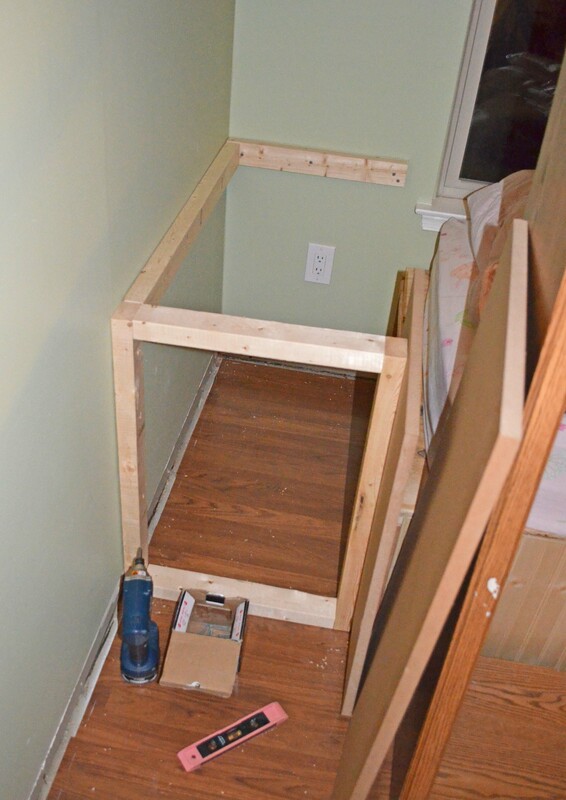 Then I added the back supports. 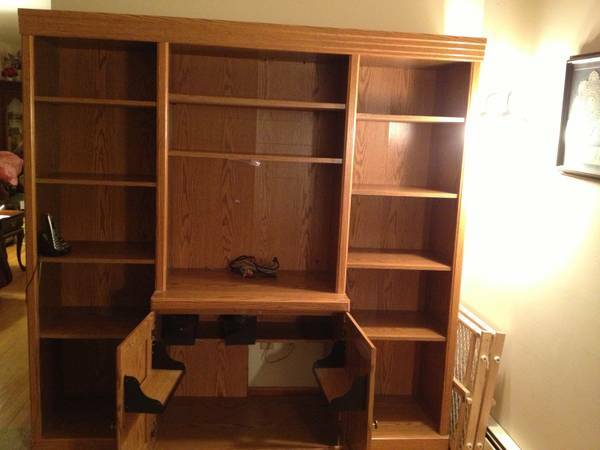 These shelves will obviously not be adjustable. They’re just too darn long at 38.25″ and need to be supported all the way along the back. 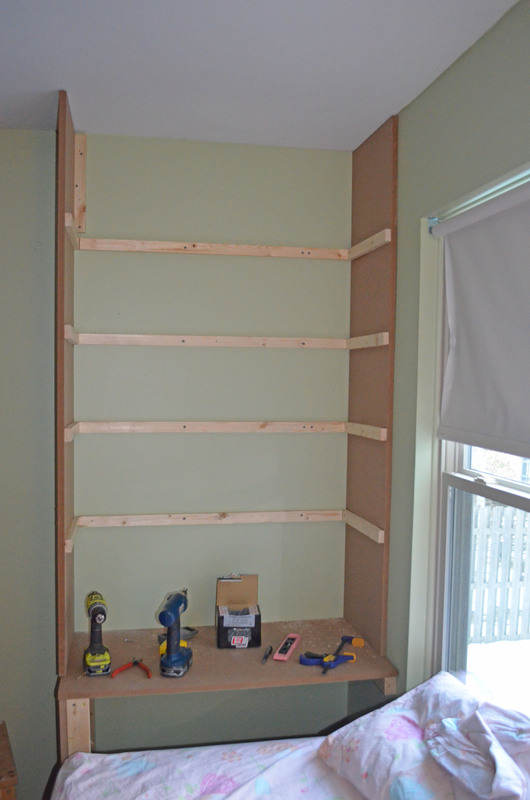 I used the sides of the Craigslist unit, and cut them to length, to make them into shelves. 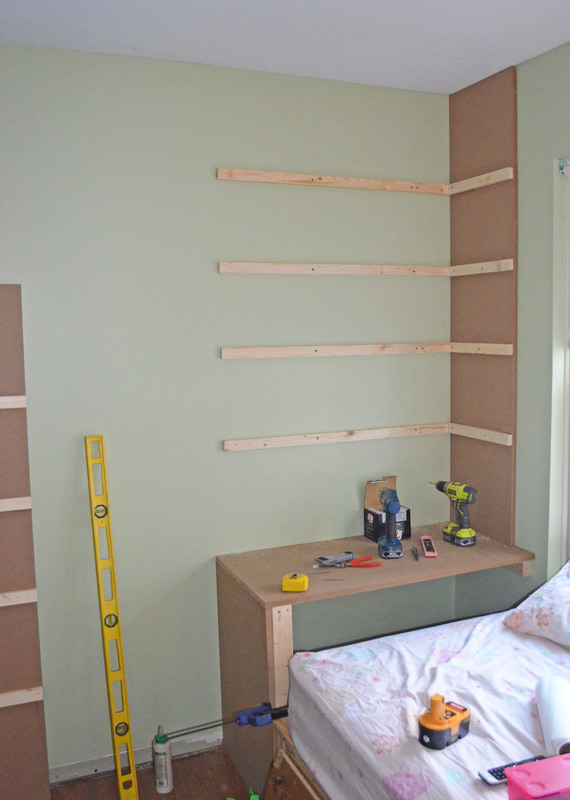 Here are the shelves resting in place, but I still need to attach them and paint everything. I’m starting part 3 right away, so stay tuned! « First Day of Winter – Ha, ha! Thanks Pat. And I’m waiting too… I’ve been meaning to get the trim pieces up for days now. Definitely this week! !